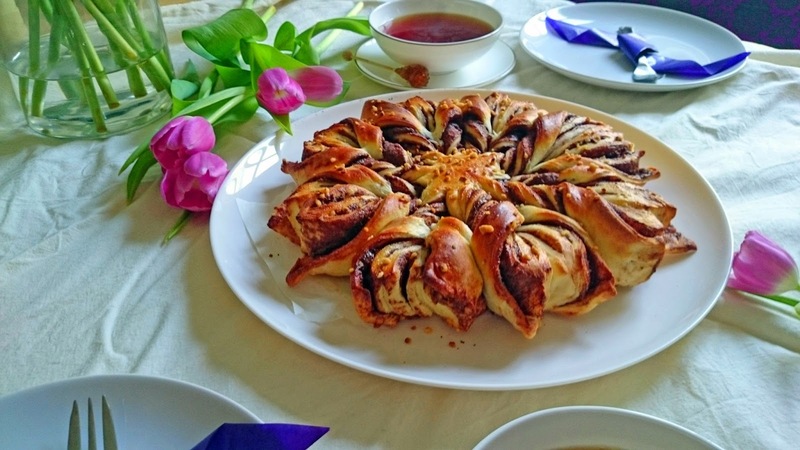 Welcome all to our second weekend recipe! 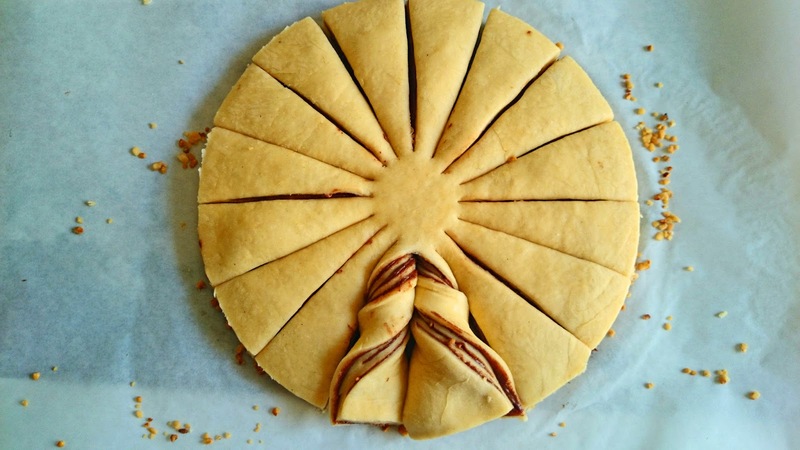 Since this week seems to be on the origami side of life, we thought it would be funny to find a matching recipe. Well...try and search for origami food/recipe/dishes. 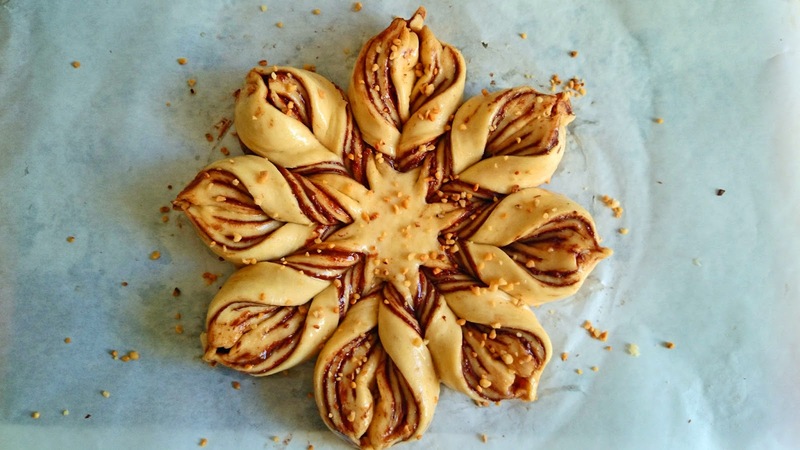 You'll end up scrolling through countless pictures of nice origami hot dogs, pizzas, cakes, petit four - all made with paper, of course. 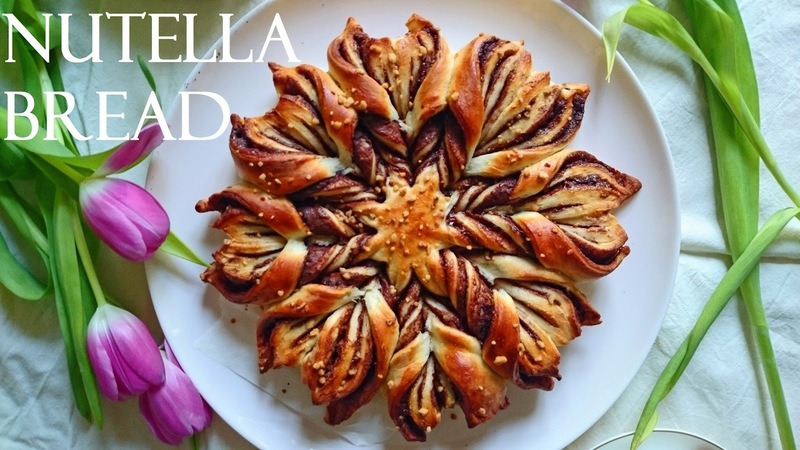 Then I finally stumbled across a recipe for nutella braided bread, which looks just delicious. As there are severeal layers and there is some kind of folding involved, I think the bread fits into our origami week. The original recipe is without brittle, but as my boyfriend likes to say: more is more! 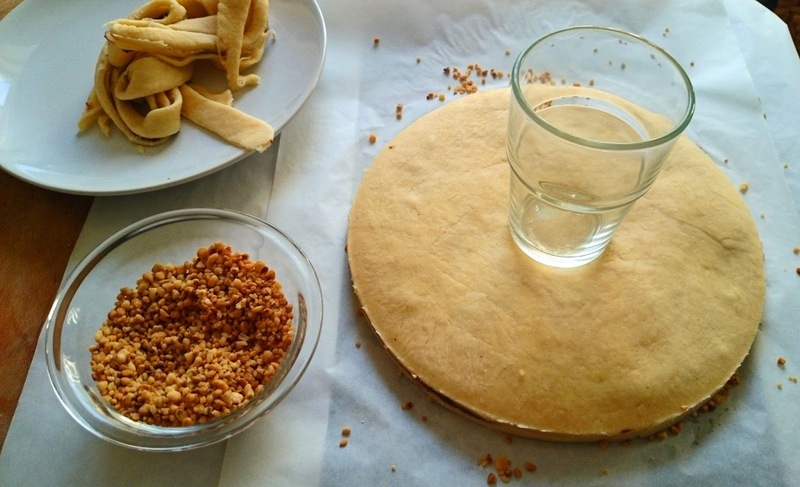 Mix flour, salt, sugar and yeast in a bowl. Melt butter and milk in a pot and pour it over the flour. Add the egg yolks and knead everything thouroughly until the dough is smooth and you can easily form it into a ball. Put the dough back into the bowl, cover it with a dish cloth and let it rest for about an hour. It will almost double its size. 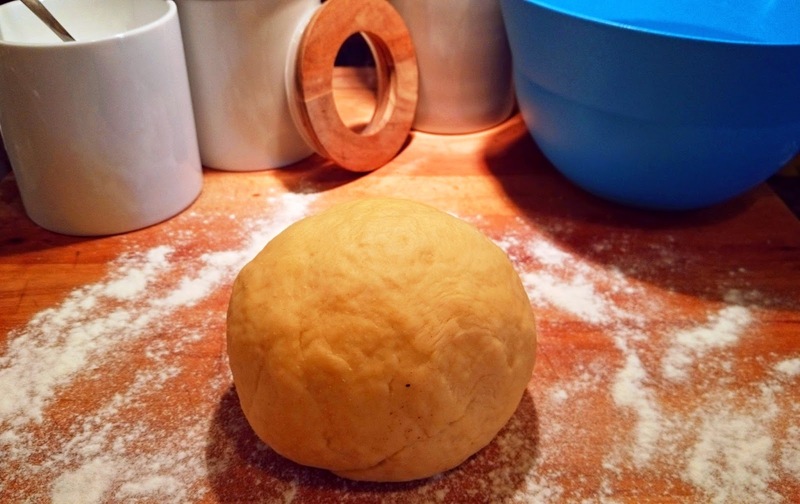 Knead the dough once more and form it into a large roll. Then cut the roll into four pieces. 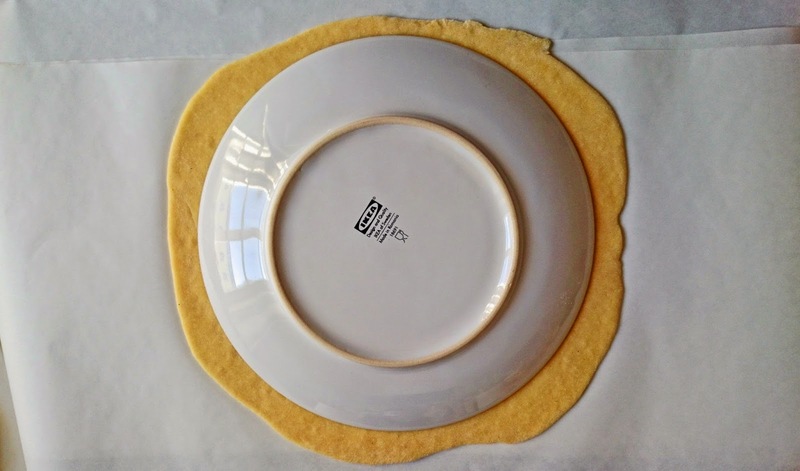 Start by rolling out a piece of the dough, ca 30cm (about 12 inch) on a sheet of baking paper. 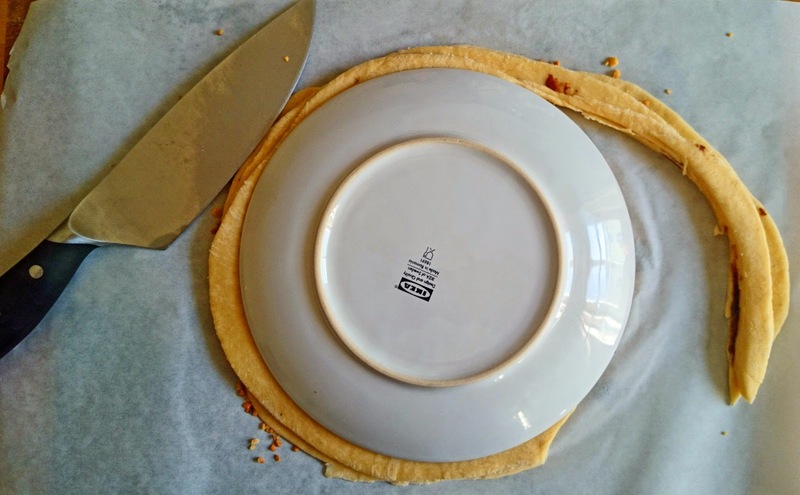 Place a dessert plate on top and slightly press it down. 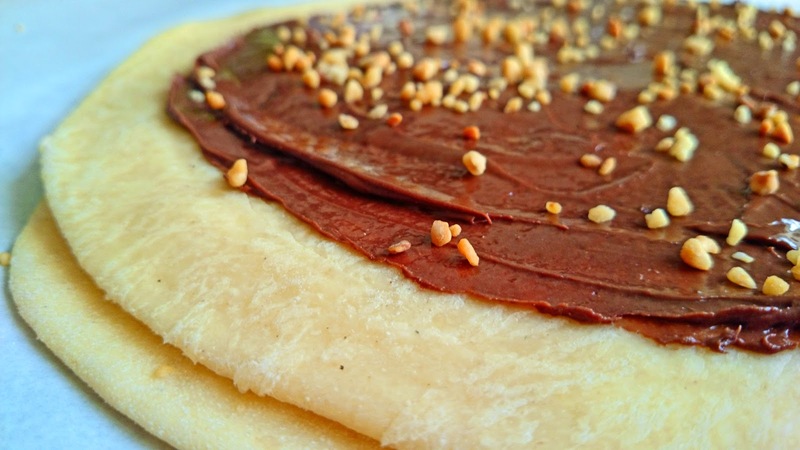 Spread the inside of the circle with nutella and sprinkle some brittle over it. 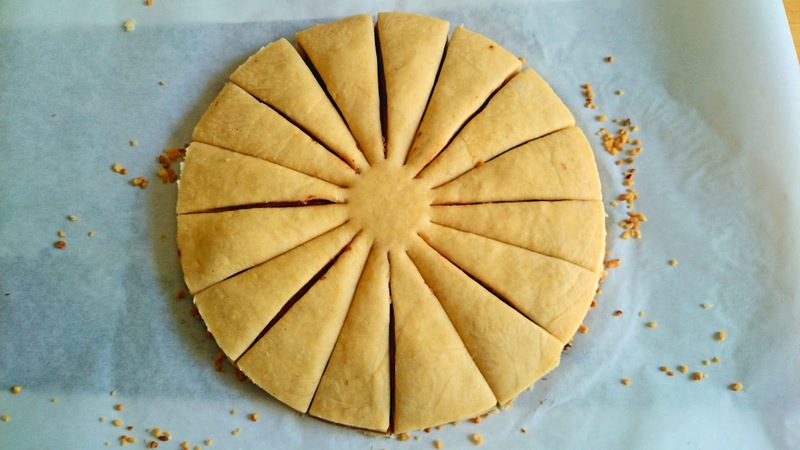 Pull the sheet onto a backing tray and start with the next piece of dough. Already looks so yummy!! 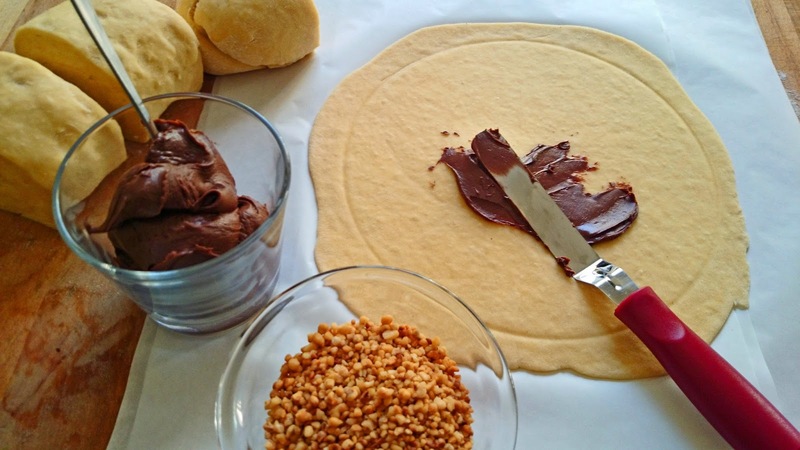 Put three pieces of rolled out and nutella covered dough on top of each other. 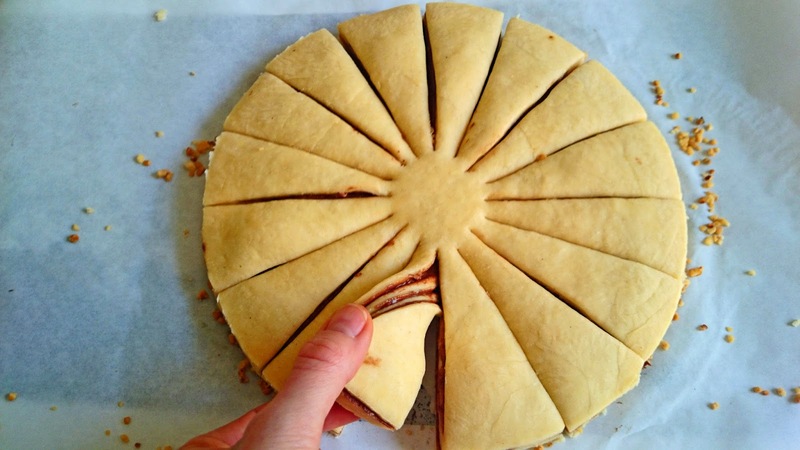 Roll out the remaining piece and put it on top without spreading nutella onto it. Cut off the rim by using the same dessert plate as mark. Use a small glas or other round object to mark the center of your bread. Gently cut the bread into 16 pieces. Carefully twist one of the pieces to the left. Repeat on the other side but twist to the right. 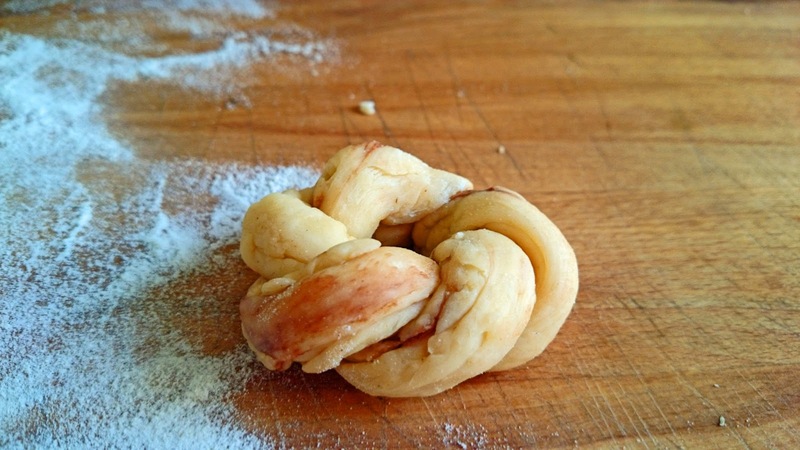 After twisting all pieces, press the ends together thouroughly with your fingers. Let the bread rest for another 30 minutes. In the meantime, preheat your oven to 180°C (360°F). 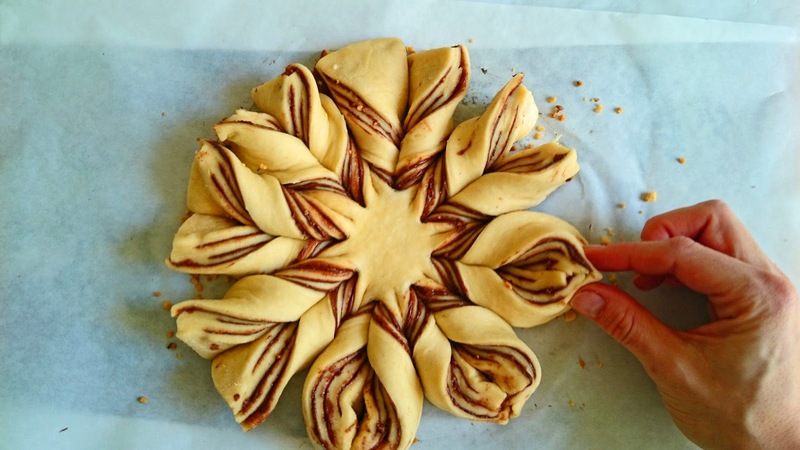 Don't waste the remains of the dough, make small wreaths for example. 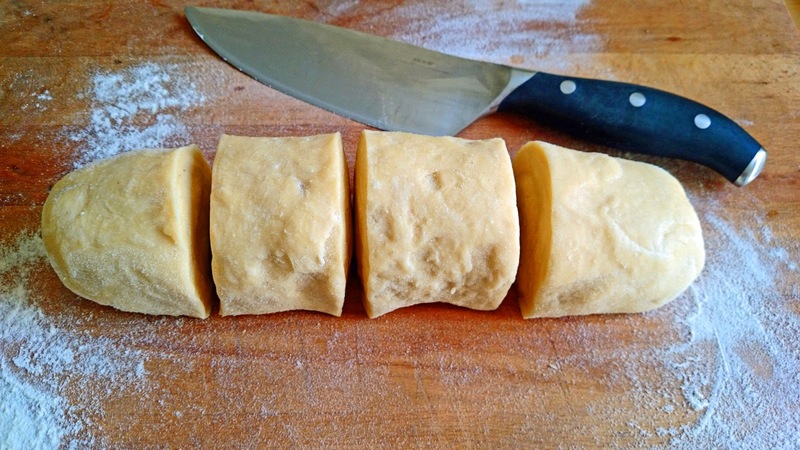 Therefor form two small rolls at a time, twist them together and make a circle. If you don't want to eat them right away, put them in the freezer. You can easily warm them up later. Finally glaze the bread with the remaining egg whites and sprinke some more brittle on top. Put it right into the oven and let it bake for about 30-35 minutes. I am so glad I tried this recipe as it looks and tastes just fantastic.